You can send us a service request anytime using the form below. It gives us all the information we’ll need to pickup and service your equipment. When we receive your request we will place you on our pickup schedule. You will be called prior to the pickup/delivery date with instructions and a time frame. with the information from the form. Check out our winter service program. 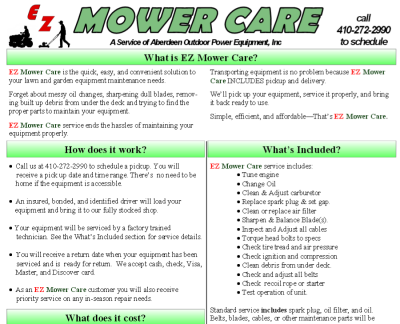 The EZ Mower Care winter service program is the best deal of year to keep your lawn equipment operating properly. This service is only available over the winter months but guarantees that your mowing equipment will be ready to mow for the 1st cut in spring. We encourage you to sign up early to avoid pickup or delivery delays due to snow cover. We begin pickups in November. Download the flyer below for all the details and pricing on this popular service.